Genesis developers build completely bespoke websites based on the Genesis Framework. 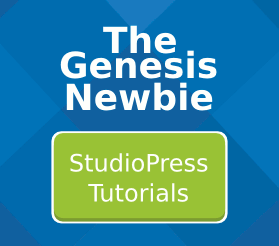 But there is an intermediate step between my StudioPress theme setup service and hiring a Genesis Developer. But how can you do that? First you need to be proficient in using WordPress and the Genesis Framework. Then buy the Dynamik website builder theme or a plugin that makes tweaking and changing your Genesis based website much easier. Genesis Design Palette Pro (plugin). If you’re proficient with WordPress you’ll find this easy to use. Genesis Extender Plugin. Powerful, edits PHP and CSS but takes time to learn. Dynamik Website Builder (fully customizable theme builder). If the words “Dynamik Website Builder” don’t strike fear in to the hearts of genesis developers, it’s because they haven’t seen it used in anger. This is a serious piece of kit, but has quite a learning curve if you want to use it to it’s full potential. Not all WordPress developers understand the Genesis Framework. I’d recommend you find a genuine Genesis developer. Bill Erickson is the most famous Genesis developer I know of. Bill is efficient and an expert in his field, which is WordPress development on the Genesis Framework. If you’ve got thousands to spend and want a safe bet. Bill could well be the man for you. Bill Erickson has contributed code to WordPress and the Genesis Framework. Jared Atchison actually helps build the Genesis Framework, he’s a core contributor. If you have a big project and need a long term partner he might have just the skills you need. This is a quote from Jared Atchison’s website “if you need a theme created or customized, and it’s using the Genesis Framework, few people are going to be more comfortable or work more quickly than I will.” If you need a WordPress consultant for a large or complicated project Jared could be the man you need. StudioPress publish a list of over two dozen freelance Genesis developers and agencies who they trust and recommend. My advice would be to browse through the list of Genesis developers. View their portfolios and read their websites. See if any appeal to you. If you like their style, get in touch and see if you think you could work together.